Open your account at 234Bet and receive up to N500.000! 234Bet has recently started to operate in Nigeria, and it has prepared an interesting welcome bonus for all new players. The 234Bet sign up offer is a deposit match bonus that rewards your first 4 deposits. Keep reading for more details about the 234Bet welcome bonus. You must be older than 18 years in order to claim the promotional offer. The 234Bet welcome bonus is exclusively reserved for residents of Nigeria. This offer can’t be combined with another offer proposed by 234Bet. You can claim this offer only once. Wagering requirements apply. See the table above. The welcome offer is valid for 30 days. The procedure for creating an account is very straightforward. Just follow these steps and you’ll successfully open your account in no time. Once you visit the 234Bet, at the top right corner on the homepage, click on ‘Register’ button. The registration form will pop up on your desktop. Fill it in with correct information. Enter your first and last name, date of birth, email address, phone number. Choose your password and confirm it. 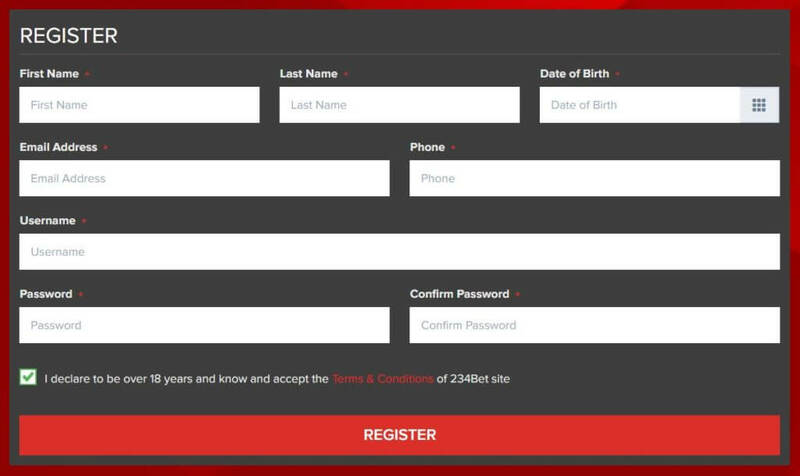 When you complete all the required fields, check the box that says that you are over the age of 18 and you accept the terms and conditions of the bookmaker. Of course, before accepting the terms and conditions, make sure to read them. Click on “Register” button in order to submit your application. The 234Bet is a brand new, innovative and safe online sports betting operator that you can find on the Nigerian market. It’s a great opportunity for all those who want to experience a whole new betting adventure. This bookmaker offers various types of sports and markets that you can bet on. When you visit the website, you will see that you can find different sports such as Soccer, Tennis, Basketball, Volleyball, Baseball, Ice Hockey, American Football, Bandy, Boxing, Darts, Handball, Rugby, Snooker, eSports, Floorball. The main advantage of 234Bet is the 24/7 live betting service with a possibility of cashing out your bet. What does it mean? With live betting, you can place bets during a game while the odds are changing as you watch the live event. In-play betting puts you in control of your bets, while the cash-out feature makes it possible to cash out your bet before the sports event has finished. You’re in charge of the destiny of your own bets! Once you create your account, you need to make a deposit. Our bookmaker allows the following banking options. There are no additional costs and fees for transferring money. There are some limits, like the minimum deposit amount, which is NGN 10, and the maximum deposit amount that is NGN 1.000.000. The website is user-friendly. You can easily navigate through it and browse the available sports events. Safe, secure and trustworthy – these are the words that we can use to describe the 234Bet sportsbook. Plenty of betting markets, sports events, competitive odds and attractive promotions are the reasons to choose this new operator on the Nigerian market. If you decide to start using the services of 234Bet, don’t forget to claim the welcome bonus! It’s a great way to start your betting adventure!